We carry Windstone Editions and Alberti Designs. We carry all of the Windstone Editions crafts collectible figurines. 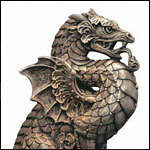 Along with the dragons, fantasy and feminine inspirational figurines, animal, bookends, candle lamps, castles. garden art, gargoyles, magical creatures and wizards by M. Peña and Maya Hill. Windstone Animals a unique and unforgettable world of fantasy where Unicorns roam! Our Windstone Bookends sculptures are museum reproduction quality.